Sweet clover (Melilotus alba) is an obnoxious weed that readily invades prairies (both planted and remnant). Its seeds are known to persist in the soil for many years, making eradication especially difficult. 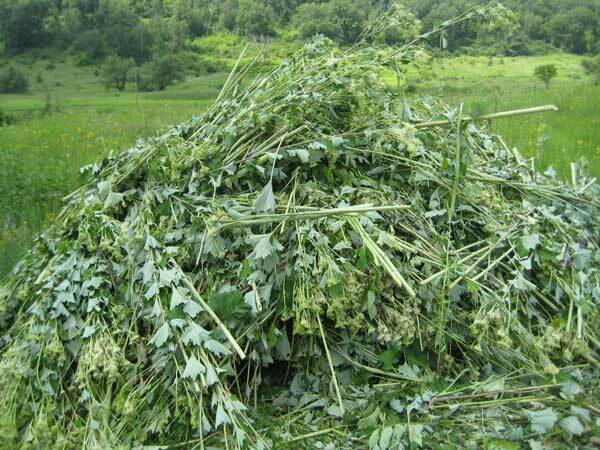 Sweet clover is generally considered to be a biennial plant. According to most of the scientific literature, the first year it grows only vegetatively, forming relatively small shoots and extensive underground root systems. After a winter cold spell, the plant differentiates one of more vigorous flower stalks, which grow into large plants forming numerous seeds. 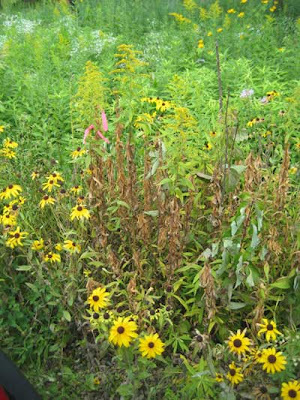 Because the first-year plants do not flower, eradication usually focuses on the second year plants. The best approach is to pull the plants up roots and all, which usually works well when the ground is moist and the plant is not too large. 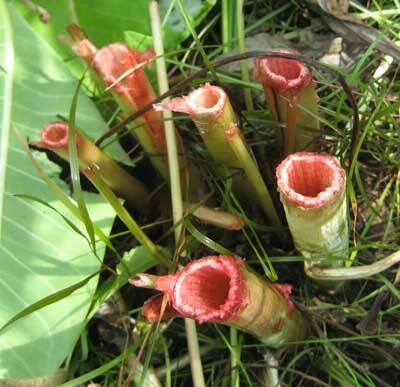 If the plant is too large to pull by hand, then its stem can be severed with a sharp shovel below the base, and the severed stem, which contains dormant shoots at the root collar, can be removed. For the past several years, late in the season (such as now), Kathie and I have been seeing small flowering plants. 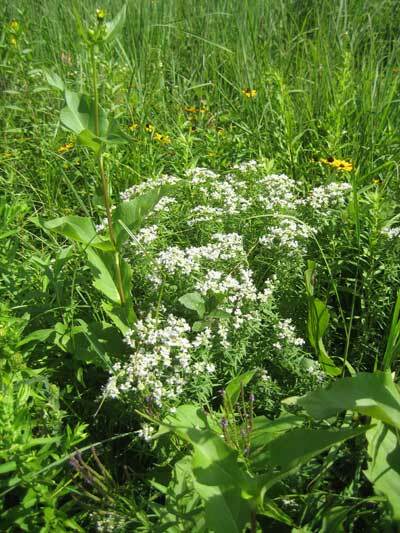 These plants are often hidden among the lush prairie vegetation that often forms this time of year. What are these plants? Late bloomers? Or first-year plants that have flowered? As it turns out, both annual and biennial forms of sweet clover exist, and the genetics of this trait was worked out many years ago. (Smith, Hugh Burnice. 1927. Annual versus biennial growth habit and its inheritance in Melilotus alba. American Journal of Botany, Volume 14: 129-146.) The annual form is thought to have originated by mutation from the biennial form. It seems that the biennial form is most frequent in colder regions, suggesting that the biennial condition is an adaptation to overwintering. Annual forms are found in warmer parts of the U.S., such as Mississippi and Alabama. Smith's research showed that the annual and biennial forms differ by a single gene, and he hypothesized that the annual form was derived from the biennial form by a single mutational event. Despite its small size, this plant has flowered. (See an enlargement of the flower stalk in the photo to the right.) It has also produced seeds on the lower parts of its inflorescence, which have already dropped to the soil. Although only a few seeds may have been produced, these seeds are almost certainly capable of germination. It seems that there are important implications here for the work on eradicating sweet clover. These tiny plants can easily be missed, especially this time of year, when all the other vegetation is so lush. Also, our work on sweet clover at Black Earth Rettenmund Prairie (where the infestation has historically been very bad) has shown large numbers of tiny flowering plants in September and October. Previously, we had thought these were resprouts of plants that had not been pulled properly, perhaps broken off at the stem base. Now we are inclined to think that these late-blooming plants might also be annuals. The hypothesis is that we may be dealing with two kinds of sweet clover plants, the large biennials that have overwintered, and the small annuals that have arisen directly from seeds. For those trying to eradicate sites of sweet clover, this idea may be quite depressing, because it suggests that we need to continue sweet clover work on into the fall, making extensive surveys for the presence of small flowering plants. We will be interested to learn whether other restoration ecologists in southern Wisconsin have also found evidence of annual flowering plants. Although black-eyed Susan (Rudbeckia hirta) has been in flower for weeks, another "Susan" has just started. This is Rudbeckia triloba, a nice species that does well in our open savannas as well as the mesic prairies. In Wisconsin, it is found almost exclusively in the southern part of the state, and Iltis and Cochrane express some doubts about its provenance. However, it is a handsome plant and at Pleasant Valley Conservancy it seems to be "well behaved". Since it is widespread in Illinois, it is possible that this is a species that is moving north as a result of global warming. According to Illinois data, this is a biennial or short-lived perennial. Since it is a prolific seed producer, we don't have to worry about maintaining it. It can easily be distinguished from R. hirta by the smaller sizes of its flowers and the three-lobed structure of its lower leaves. Another species, Eupatorium sessilifolium, is just starting to flower now. This is a State-listed species (Special Concern) that existed only at a single location at Pleasant Valley Conservancy before we began restoration. The original "patch" in Unit 8 had only five plants. Control of buckthorn and sumac helped it spread. Last year we had over 25 plants at the original site and this year Kathie counted 102 plants in that same area. Also, it is spreading to new areas on its own. I have found another patch of three plants at the opposite end of Unit 8, plus a new plant in Unit 19D. In addition, in 2005 we started raising plants in the greenhouse and putting them out in suitable savanna areas. Although seed viability is quite low, the seeds that do germinate produce vigorous plants which transplant well. We now have over a dozen other locations where this species is growing. It is not too hard to figure out from the photo below where the name "sessilifolium" came from! Kathie and I were delighted to have the Thomson family as visitors on Wednesday (July 28, 2010). Olive and John Thomson have been long-time supporters of the Nature Conservancy and the Prairie Enthusiasts in the Dane/Iowa County areas. John died in 20 Feb 2009 at the age of 95. John's popular course in plant taxonomy at UW-Madison influenced generations of botanists and plant ecologists. John was a student of the great Norman Fassett and did the first research on prairie remnants in Wisconsin (Ecological Monographs, 1940, Relic prairie areas in Central Wisconsin, Vol. 10, pp 685-717.) Olive was also a student of Fassett and authored the revised edition of Fassett's "Spring Flora of Wisconsin." 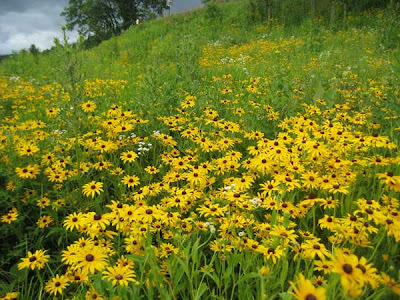 The Thomsons have been strong supporters of prairie restoration in southern Wisconsin. The Nature Conservancy site "Thomson Memorial Prairie" is one of the premier sites for grassland bird habitat in Dane County. It is named in memory of the Thomson's deceased son Douglas. 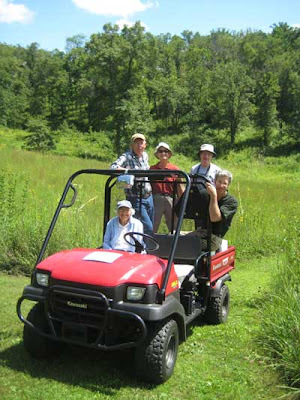 The Schurch-Thomson Preserve, one of the prime Prairie Enthusiasts sites in its Mounds View Grassland, was generously donated by the Joan Schurch/Dennis Thomson family. The Thomson's have also set up a substantial maintenance fund for this site. In addition, the John W. Thomson Memorial Fund has been set up to further the educational mission of the Prairie Enthusiasts. Since Kathie and I have begun restoration work, we have been honored to become friends with Olive and the Thomson family. This week, due to a fortuitous set of circumstances, all three of Olive's sons visited the Madison area at the same time and she arranged for them to visit Pleasant Valley Conservancy. After a relaxed lunch at Luckenbooth's Cafe in Black Earth, we spent the afternoon on a delightfully sunny day touring the Preserve. The photo shows Olive (seated) and (from L to R) Dennis, Kathie Brock, Norm, and Rod. Things don't get any better than this! I use the term "spritz" to indicate a brief squirt of an herbicide on a plant leaf. The herbicide I am using is the oil-soluble form of triclopyr (Garlon or Element 4) diluted in Bark Oil (at a 15-20% concentration). This is a new technique for me, and I have found it to be very effective in "killing" woody or nonwoody invasive plants. This post describes its use for control of small buckthorn seedlings, the usual growth form arising from the seed bank, and for Canada goldenrod, a persistent rhizomatous invader. I think this technique has wide application in restoration work, but I have only tested so far it in a few cases. However, it appears so useful that I hope others will test it also. The photos here show what happened to buckthorn stems five days after only "two" leaves were spritzed with herbicide. There was no attempt to completely cover the sprayed leaves. Rather, a single spritz from a small spray bottle was directed at each leaf. The original intent had been to use the basal bark technique on these small stems. However, this time of year, when there is so much living plant biomass on the ground, it is difficult to expose bare stems for the basal bark treatment. Instead, I just spritzed a couple of leaves. Note that even the leaves that were not spritzed were affected. In fact, the whole plant is killed. This technique is easy to use. Our crew has been working in very leafy bur oak savannas where almost all of the plants were "good", with occasional buckthorn seedlings. It takes a second to spritz two leaves. Since most buckthorn seedlings are multi-sprouted, it takes about 10 seconds to spritz two leaves on each stem. The buckthorn plants are easy to spot, since the leaves have a characteristic dark-green lustre. The stems of most buckthorn plants are erect and the leaves are clear of any "good" plants. Spritzing is just a one-handed operation. Although I have been spritzing two leaves, only one may be necessary. The leaf-spritz technique also works well for nonwoody plants. 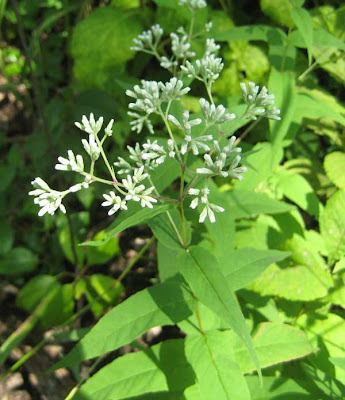 I have used it extensively for woodland sunflower, and have been testing it for Canada goldenrod. Again, spritzing a couple of leaves of each stem is all that it takes. The photo here shows a small Canada goldenrod clone that was spritzed about two weeks ago. Again, just two leaves were treated. The stems that were not treated were unaffected. Note also that the Rudbeckia hirta stems adjacent are not affected. 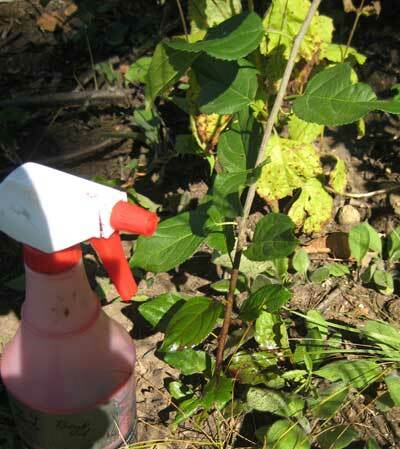 It is very easy to spritz a leaf without getting herbicide on nontarget plants. We use simple spray bottles that one can purchase at any hardware store, in 16 and 32 ounce sizes. Because so little herbicide is needed, the 16 ounce size works well. I carry the bottle in a pouch bag fastened to my belt. These bags are sold for carpenters to carry power drills, but they work fine for spray bottles. With the spray bottle at the waist, it is always ready when a new target plant is found. Our wetland plants are really flourishing! The mid-April burn obviously helped a lot, although our wetland has always had a fairly diverse flora. Reed canary grass is under control. The six inches of rain last Thursday and Friday resulted in a transient flooding, but by Sunday the water had dropped almost back to normal. 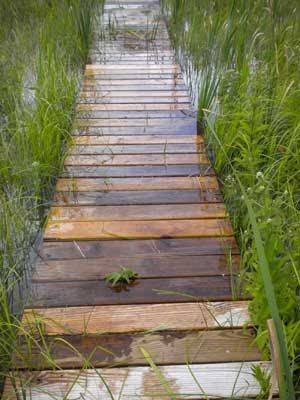 The fire break between the Crane Prairie and the wetland provides a great walking trail, and the new boardwalk brings one right into the wetland and all the way to the creek. We have had lots of rain this summer, which has helped our upland areas, but the wetland, being spring-fed, never has a shortage of water. Most of the substantial rains have been spaced far enough apart so that flooding has not occurred, but the rains of last Thursday-Friday came all at once. Our rain gauge registered almost six inches. When Amanda arrived for work Saturday morning, the whole wetland was flooded, including the boardwalk, as shown on her photo here. However, by the time I arrived on Sunday morning, the boardwalk was again high and dry. During the much heavier rains in June 2008, our wetland had standing water for several days before it finally subsided. Of course, wetland plants are adapted to occasional flooding, and survived without any problems. We have several vegetation types in our wetlands. Sedge meadows are the most common, but where there is higher water levels, cattails are extensive. On a few of the higher spots, willows and gray dogwood are present. For some reason, we don't have any red osier dogwood, a common wetland shrub. This is probably to our benefit, as this shrub can often be fairly aggressive. Probably because of the burns, Joe Pye weed and swamp milkweed have been really prolific this year. There are quite large stands of Joe Pye (Eupatorium maculatum), as the photo below, taken from the boardwalk, shows. Walking along the fire break between the Crane Prairie and the wetland gives one a close-up view of how things are going. The photo to the left is an example of what one can see. I was struck by the diversity of wetland plants. New stands of sweet Indian plantain (Hasteola suaveolens), a State-listed species (Special Concern with a C value of 8; the white-flowered plant in the photo to the left) are present, mixed in with Joe Pye, cup plant, and swamp milkweed. 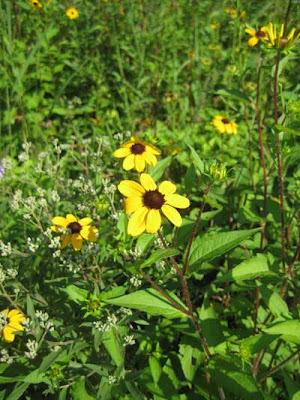 Very adaptable species such as black-eyed Susan, golden Alexanders, and blue vervain, are also present. In past years, we have found sweet Indian plantain primarily along the creek and next to spring-fed pools, but this year it has moved in closer and is growing right next to the trail. This is a rare opportunity of seeing an interesting species that is not especially common. According to the State Herbarium records, this species is found in Wisconsin solely in the southwestern part of the state (mainly the Driftless Area). Another nice species of the wet prairie is mountain mint (Pycnanthemum virginianum). Since this is an Eastern U.S. species, I suspect its common name comes from its original discovery in the Appalachian Mountains, probably of Virginia. We have always had this species scattered throughout our wetland, but this year it seems especially lush, probably because of the favorable growing conditions. Cup plant (Silphium perfoliatum), of course, is fairly common and is flowering now. Although distributed more widely in Wisconsin than Hasteola, it is mainly concentrated in the southwestern part of the state. 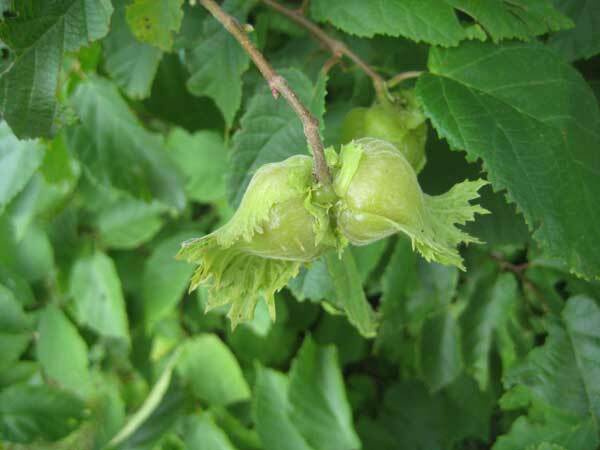 American hazel (Corylus americana), a member of the birch family, is widespread in Wisconsin but not especially common, since it has been crowded out by invasive shrubs. It is a nice "savanna" shrub which forms stunning fall color and has nice nuts that the wildlife love. Hazel was the only shrub that the original land surveyors in this area recorded, indicating that it was considered desirable, probably because of the edible nuts (sometimes called filberts). When we were clearing invasive brush at Pleasant Valley Conservancy we always left the hazel, and at present we have quite a bit of it in our open savannas. However, it is fire sensitive, and since we try to burn our savannas every year, most of the shrubs never get very large. However, we have a couple of nice specimens near our cabin which we protect from fire and these are now becoming fairly good sized. The photo shows the ripening nuts of one of these specimens. Hazel flowers are monoecious. The male flowers (catkins) form in the fall of the year and then go dormant until spring, when they complete their life cycle by forming pollen. The attractive mature hazel catkins are an early sign of spring. As in many shrub species, the female flowers are fairly inconspicuous. Although hazel is a native species, it is rhizomatous and left to itself can form large clones, especially in open savannas where light is plentiful. This is one reason why we like to burn our savannas every year, since we want to maintain the open character of our savannas. Pale Indian plantain (Arnoglossum atriplicifolium) is a species that is often found on lists for savanna restoration planting. It also grows well in mesic to wet mesic prairies. When we started savanna restoration work about ten years ago, we included this in our species mixes. Unfortunately, it has thrived too well in some of our restorations, and we are now having to deal with the consequences. One of the "worst" infestations was an open savanna area in Unit 11A, where it had been planted about 9 years ago. In the southeast corner of this unit, near the "saddle" road, it had formed a massive "wall" of plants that shaded out virtually everything else. In fact, it had eliminated one of my best purple milkweed sites. Our intern crew had some time yesterday, so we put them onto this infestation. 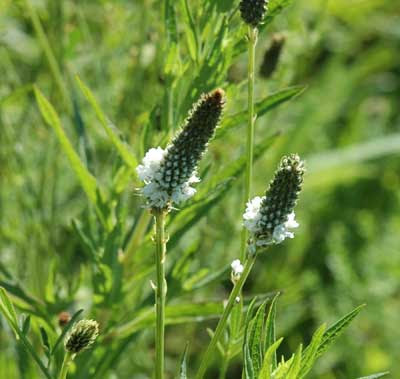 Since pale Indian plantain is a perennial, herbicide use had to be part of the process. 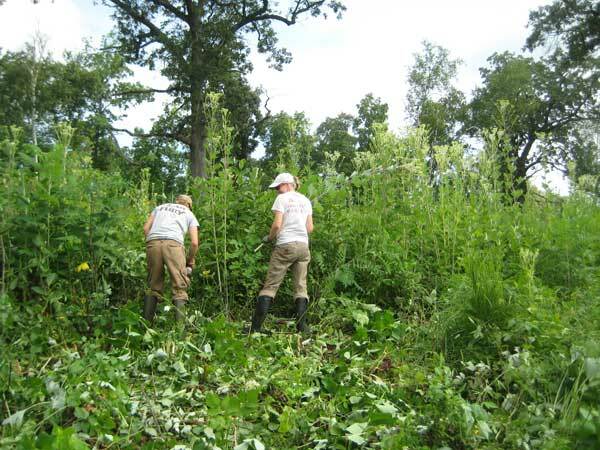 And in order to protect any other species, we cut the plants with loppers rather than brush cutters. As the above photo shows, these stems had grown more than head height. They were so dense that nothing else could grow. Because of the massive amount of biomass, the cut stems were hauled off the site and taken to our brush/weed pile. Three truck loads of material were removed! Each cut stem was immediately treated with Garlon 4, as if it were a woody plant, using a hand spray bottle. The photo here shows how large the stems were. Most of the plants were multi-stemmed. Even though these plants are not woody, this treatment procedure is appropriate, and experience with other species has shown that it works. (We have used the same procedure for reed canary grass and creeping bellflower.) The point is to get the herbicide down to the roots, so resprouting will not occur. This job took six people all morning to complete. The photo below shows the weed pile after all the cut material had been tossed on it. Quite a mess! Quite a job! I am not sure why Arnoglossum thrived so well in this particular site. In many other of our savannas it seems much better behaved. It is a little disconcerting to have to spend all this effort to control a native species that is really desirable and is found in many savanna species lists. According to Iltis and Cochrane, it is "conspicuous but rare." A Google search did not turn up any particular problems. Hopefully, a lot of the other natives that had been in this site are still present in a suppressed state and will return! 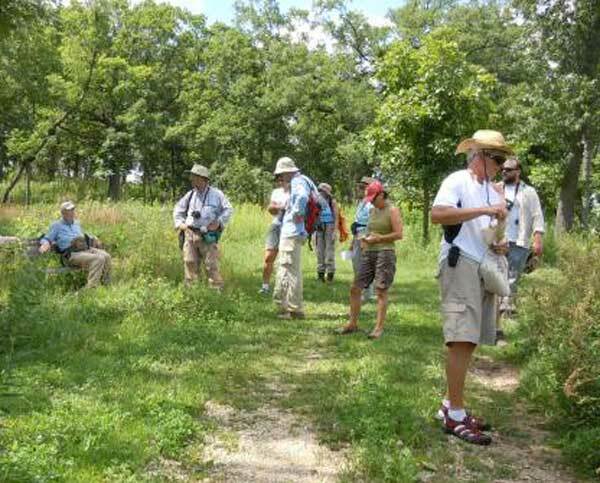 Our mid-summer prairie/savanna tour was quite a success, with a nice group of interested visitors. A brief rain-storm had moved through during the early morning but by afternoon the weather was warm and sunny. The photo (by Kathie Brock) shows a brief rest stop at the edge of the White Oak Savanna. Something always new comes out of our trips. This year one of the participants discovered a second plant of the handsome purple-fringed orchid at the edge of the Valley Prairie. Also, botanist Bob Wernerehl discovered a plant of Scutellaria galericulata (marsh skullcap) along the new wetland boardwalk (a not uncommon plant, but new for us). 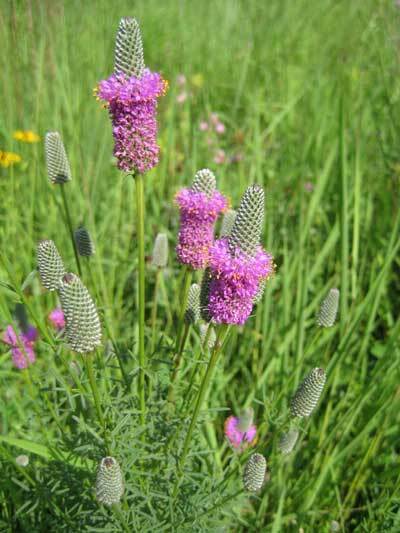 Many of the prairie and savanna herbs were at their peak, including yellow cone flower, bergamot, bottle brush grass and silky rye, big bluestem, several of the trefoils, blazing star, compass plant, Canada milkvetch, etc etc. This has been an outstanding summer for prairie plants, helped greatly by the excellent spring burns. Mid-summer is a time when attractive purple-colored species are flowering. Right now there are at least four; in addition, a few flowering pale purple cone flowers are still left. The three below are favorites. Swamp milkweed (Asclepias incarnata) is very prolific this year, probably because of the successful wetland burn that Fish & Wildlife Service did in mid April. We always have a few flowering plants, sometimes in the Crane Prairie but more commonly in the sedge meadow wetland. 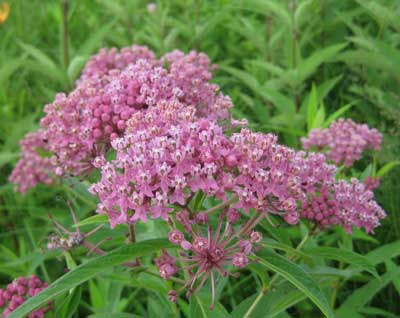 But this year, probably because of the burn, we have swamp milkweed all over the place. This will be an excellent opportunity for seed collecting. The lesser purple-fringed orchid (Plantanthera psycodes) is a very attractive orchid which popped up spontaneously in the Valley Prairie. The seed must be coming from somewhere else in our wetland, although so far we haven't discovered it. Somehow, I don't think the adjective "lesser" is appropriate, as this orchid is really large and quite attractive. 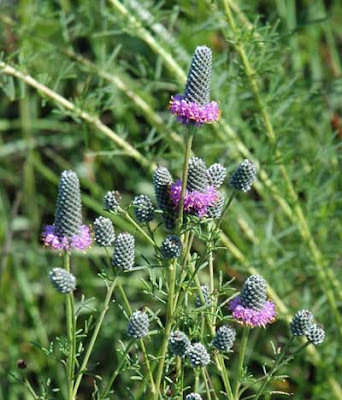 Purple prairie clover (Dalea purpurea) is one of my favorites, and we are now finding it well established both in our planted prairies and in some of the prairie remnants (where we also planted it). This species is doing especially well this summer, probably because of the frequent and substantial rains. We also have the white prairie clover (D. candida), which is more robust and also attractive, but not nearly as colorful. Prairies at their Peak: Pleasant Valley Conservancy, Sunday, July 18, 2010, from 1-4 PM. This public trip is sponsored by the Madison Audubon Society. After the trip, light refreshments will be served at our small cabin. For further further information or directions, call 608-238-5050. The compass plant, Silphium laciniatum, is an icon of the tall grass prairie, and is featured on the logo of The Prairie Enthusiasts. It does best in deeper, more mesic soils, although it will also grow on drier sites. At Pleasant Valley Conservancy our planted prairies now have compass plants in bloom, and this year the plants are impressively tall. 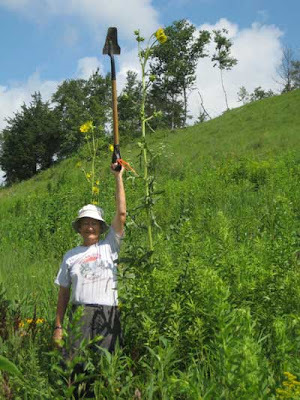 The photo here shows Kathie measuring the length (9 1/2 feet) of a plant growing in the Crane Prairie. This planted prairie, now in its fifth growing season, has dozens of compass plants in flower right now. When we started restoration work in 1997, there was no compass plant here, even in our prairie remnants, probably because of the grazing history. Cattle "love" compass plants! We are fortunate to have several native populations of Turk's cap (Michigan) lilies (Lilium michiganense). This species isn't really rare (C value of 6), but it is one of the more showy plants and a joy to behold. 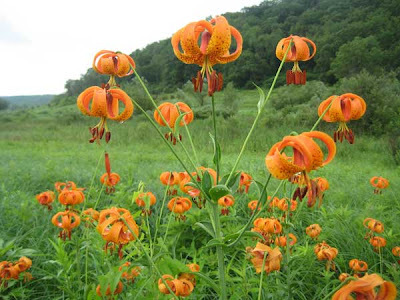 In contrast to wood lily, which is a dry prairie species, Turk's cap is found in wetlands such as "moist, mucky, peaty or sandy soils of rich, mesic to wet prairies, sedge meadows, fens, moist borders of mesic hardwoods..." etc etc (Iltis and Cochrane). "Our" Turk's cap lilies are found along the edge of our extensive sedge meadow. Most years they are fairly scattered, but this year the U.S. Fish & Wildlife Service did a great burn of the sedge meadow, and the lilies have really benefited. The population shown in the photo generally has 4 or 5 flowers, but this year I counted over 50 luscious flowers, on 9 stems. The seeds of Turk's cap lily have an interesting germination pattern, called hypogeal. The first stage of germination occurs entirely underground, where a tiny bulb is created. A cool moist period is then required before this bulb sends up a young leaf. Thus, seeds are given a warm, moist stratification period of a few months, followed by a cool, moist period, after which they can be planted. In contrast, the other lily we are familiar with, the wood lily, exhibits a straightforward (epigeal) germination, sending up a cotyledon directly. Because of the wetland burn, we are looking forward to great seed collecting in our wetland this year. 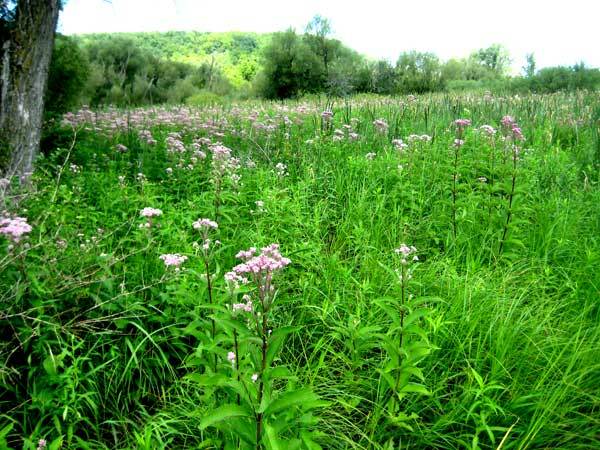 In addition to the lily, species such as turtlehead, Joe Pye weed, swamp thistle, swamp saxifrage, and sweet Indian plantain, as well as sedges, should be especially prolific. Seeing the response to the burn convinces me that we should figure out some way that we can burn at least part of our wetland every year. Our first round of sweet clover control at Black Earth Rettenmund Prairie for 2010 is now completed. We will have to come back in August and September to catch the stragglers, but the major infestations are now "history". Thanks especially to Amanda, Brendon, the Audubon Interns, Susan, and Kathie. We also had a bit of help from a few volunteers in early June. We have spent about 170 hours so far on this 16 acre prairie remnant. Last year we spent 160 hours, and 290 hours in 2008. However, we did a lot of mowing those two previous years, whereas this year everything was done by hand pulling. Perhaps we are making a bit of progress? This year our major infestations were in the North unit. The Saddle and South units were relatively sparse. In contrast, last year we had major infestations in both of those units and had to mow some especially bad areas. The biennial characteristic of sweet clover probably accounts for these differences. It looks like we will be dealing with sweet clover at Black Earth Rettenmund Prairie for many more years! However, it is worth it for this high quality prairie remnant. Black Earth Rettenmund Prairie is at one of its peak color phases now. 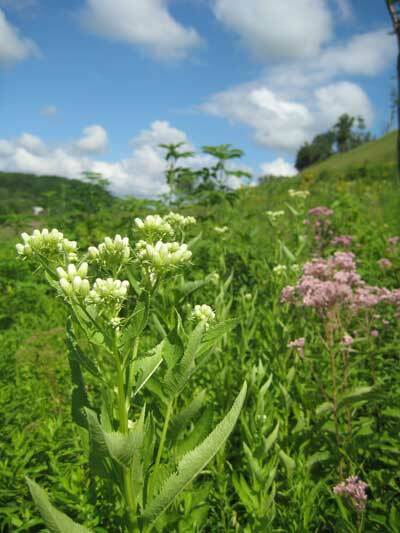 The butterfly milkweed, lead plant, coreopsis, and purple and white prairie clovers are now in full bloom. 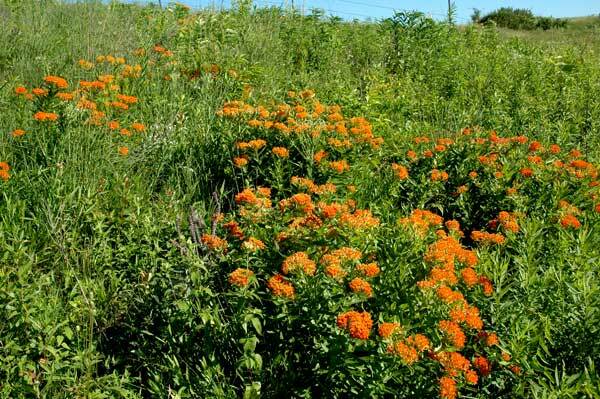 The butterfly milkweed is especially attractive. 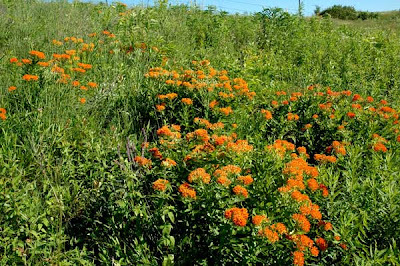 Orange is one of my favorite colors, and the flowers of very few native plants are that color. But Asclepias tuberosus is an exception. The South unit, especially, has many plants in full bloom. This is especially gratifying because when Kathie and I took over the management of this prairie, the South unit was primarily honeysuckle and other shrubs. What a fine turnaround! 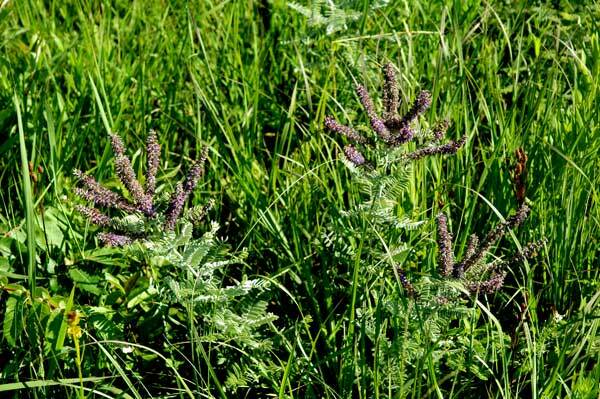 Lead plant (Amorpha canescens) has always been prolific at Rettenmund Prairie, and this year is no exception. Finally, both of the prairie clovers (purple and white) are in full bloom. Although not as showy as the above, their delicate flowers are quite appealing. The 22nd North American Prairie Conference will be held at the University of Northern Iowa (Cedar Falls, IA) on August 1-5, 2010. Savanna Oak Foundation, Inc. is pleased to be a sponsor of this conference. The schedule of sessions, field trips, and other activities can be found at this link. The Prairie Conferences have become a tradition and anyone interested in prairies would enjoy attending. The proceedings of these conferences (now available on-line at the U.W.-Madison Digital Collections) provide the most useful repository of information on Midwest prairies.